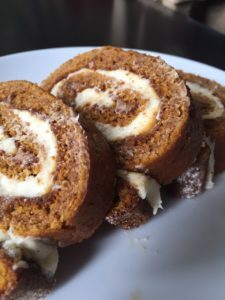 Just in time for Halloween, try this quick and easy pumpkin roll dessert with a Clairesquares caramel and cream cheese filling. Optional: add your favorite nuts in the cake batter. 1) Pre-heat oven to 325 degrees Fahrenheit. Butter a 15″ x 10.5″ x 1″ jelly roll pan. Dust with a light coating of flour and set aside. 2) In a standing mixer, cream together eggs, sugar, and pumpkin puree. 3) In a separate bowl, add flour, baking powder, baking soda, cinnamon, cloves, and salt. Mix all dry ingredients with the creamed eggs, sugar, and pumpkin puree until combined. Pour batter onto prepared jelly roll pan and bake until done, about 9 minutes. To test doneness, press roll slightly. If the roll springs back, it is done. If it is still sticky, bake it longer and check every minute until it is done. 4) While the pumpkin roll is baking, prepare a kitchen towel by laying it flat on a counter top and dusting it generously with the reserved 1/4 cup of powdered sugar. 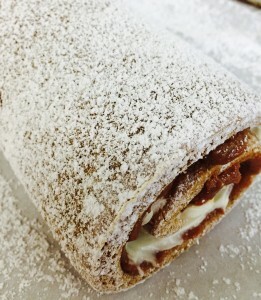 Once the hot pumpkin roll is removed from the oven, immediately flip it onto the towel and roll it up in the towel. Allow the pumpkin roll to cool for 45 minutes. 5) In the meantime, make your cream cheese frosting by mixing your cream cheese, powdered sugar and lemon juice. 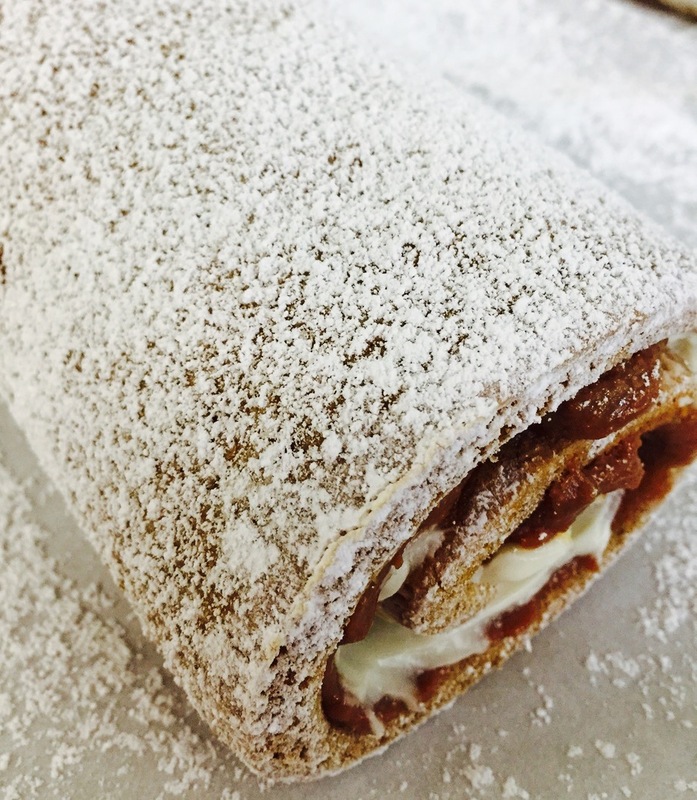 Once the pumpkin roll is cool, unroll it and gently heat the Clairesquares caramel. Spread the caramel followed by the cream cheese frosting onto the pumpkin roll and roll it up. Dust with more powdered sugar and cut into 1″ slices. Best served at room temperature. This entry was posted in Blog and tagged caramel, pumpkin roll, recipes.